Award ceremonies can be an overlong, smug exercise in self-congratulation. 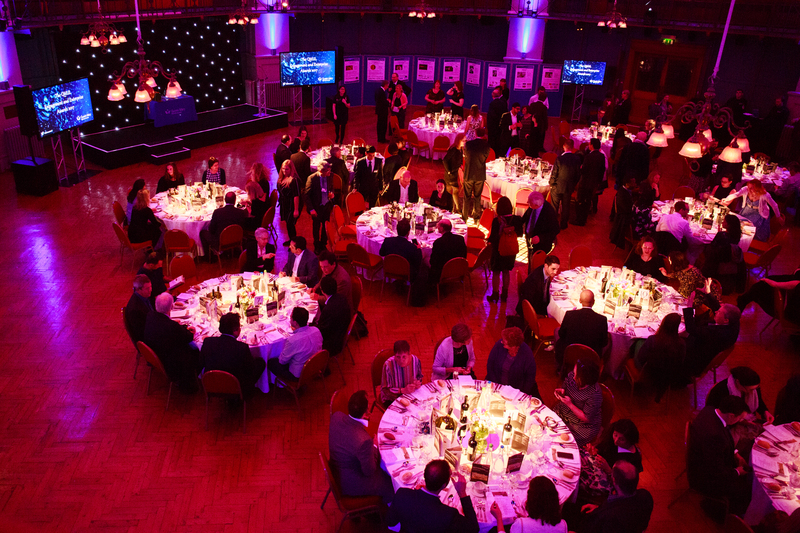 Or an opportunity to celebrate hard work, excellence, and significant contributions. 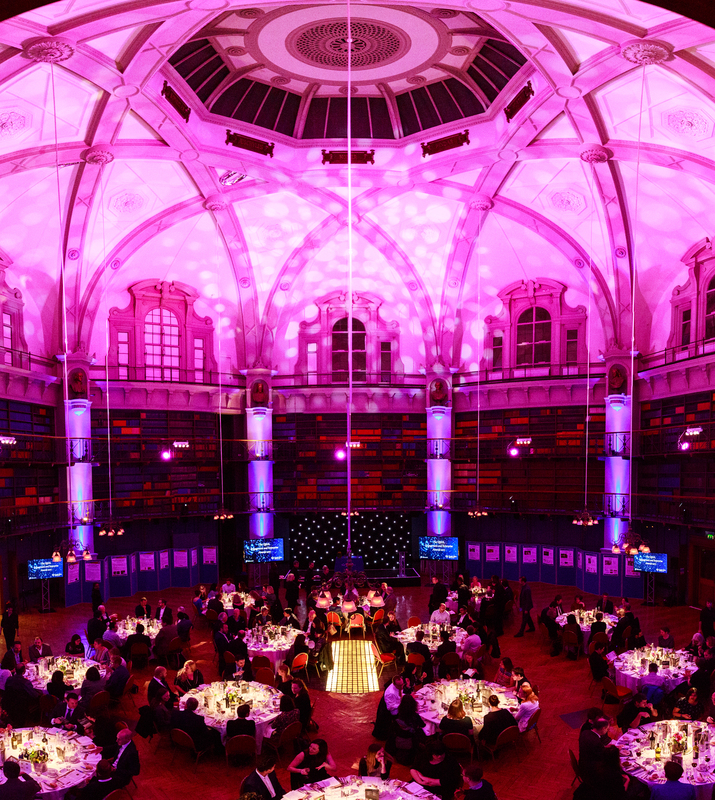 Last Tuesday evening in the gorgeous Octagon Room in the Queens’ Building, students, lecturers, and alumni of Queen Mary University came together over dinner to celebrate a huge range of research projects and community engagement projects over the past year. They recognized all those pushing to make Queen Mary, our local community, and the wider world a better place. Professor Simon Gaskell, the President and Principal of Queen Mary University, opened the proceedings by underlining the breadth of projects to be presented over the coming hours. The pride in being at the helm of the University conducting such a range of research was evident. He gave us a taste of what was to come: staff and students who are constantly pushing to do all they can to improve the world, whether through medical research, innovative new apps helping to preserve food that would otherwise end up in landfills, or through telling the stories of those who don’t have the means to get their voices heard. Matt Parker, a charming Maths Fellow and professional stand-up comedian, guided us through the evening. He introduced all those presenting the awards throughout the evening, including Peter McOwan (Vice Principal of Public Engagement and Student Enterprise), Sian Halkyard (interim Deputy Director of Communications), Professor Bill Spence (Vice-Principal of Research), and Professor Rebecca Lingwood (Vice-Principal of Student Experience, Teaching and Learning). Bruce Dickenson (lead singer of Iron Maiden) even made an appearance. Who knew he was a Queen Mary Alumni, and even has an award named after him? There were awards under four categories: Public Engagement; Media Relations; Business Innovation; and Student Enterprise. An impressive number of PhD students were among the nominees, including one on a winning project (Ethnie Nightingale, who was involved in ‘Child Migrant Stories’). Other PhD student finalists were: Carey Newson, working on a project called ‘Teenage Bedrooms’; Jahvani Daru, working on ‘Katie’s Team’; as well as Caroline Spence and Jess Potter, within the Media Opinion/Comment Piece Award Category. 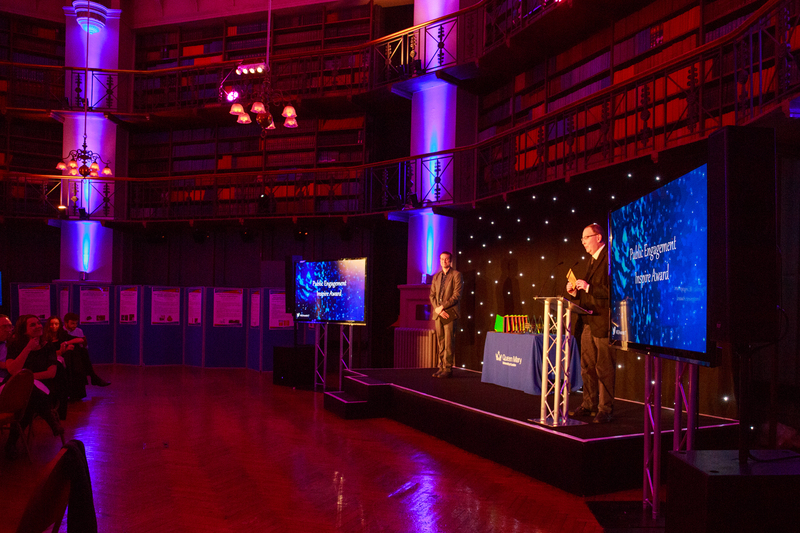 The Public Engagement Inspire Award: for those who have inspired others by finding creative and engaging ways to communicate their research; such as to raise young people’s aspirations or enthuse new and different audiences. Headed up by Alison Thomson and Harriet Smith from the Blizard Institute of Cell and Molecular Science, and co-designed with Barts MS researchers, clinicians and nurses, as well as designers, drama teachers, and families dealing with Multiple Sclerosis, this project consisted of a set of educational activities aimed at 6-12 year old children who had parents with Multiple Sclerosis. The activities hoped to teach the children about the science behind the chronic disease and has been running in and around London since 2013. 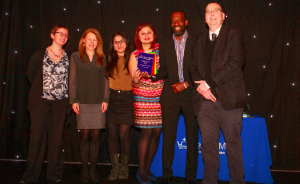 The Public Engagement Involve Award: for activity where the public can contribute their knowledge, expertise or time to research, such as citizen science, patient involvement and collaborative research projects. PILI is a feature film co-produced with women living in Pwani, Tanzania, based on their stories of the everyday risk of HIV/AIDS, single parenthood and informal employment. The film’s story is directly based on the stories, experiences and knowledge of 85 women from Miono, Mbwewe and Bagamoyo, and draws on Sophie Harman’s research on gender, global health, and African agency. Run by Marcus Pearce and Samantha Duffy from the School of Electronic Engineering and Computer Science, Steve Reich’s Clapping Music is a free iPhone/iPad app designed to engage audiences with a new music genre, using a novel interactive game-based approach to teach users to play minimalist compositions. The aim is to inspire curiosity about a music genre that may previously have been unfamiliar to users, whilst collecting data to investigate what makes one rhythm more difficult to play than another. The Public Engagement Interact Award: recognizes the partnerships, collaborations and community connections that are essential to public engagement, so seeks to celebrate excellent engagement and the partnerships which underpin these projects. One of my favorite projects of the evening, this project was a collaboration between Ethnie Nightingale from the School of Geography, Theresa Hare-Duke from the V&A Museum of Childhood, Mitch Harris from Mitch Harris Films and Linh Vu. This project drew on research into people who, under the age of 18, had migrated to Hackney, Tower Hamlets and Newham from 1930 to the present day. The aim of the project was to simulate interest in, and open up debate about, the experiences of child migrants both in the past and present. The Public Engagement Influence Award: for activities where research has been used to influence a shift in attitudes or the way that things are done, whether this be organizational change, influencing policy, or how people think about a topic and their actions. Lead by Maggie Inchley and Sylvan Baker from the School of English and Drama, in collaboration with Sadhvi Dar, from the School of Business and Management, this project works with disadvantaged children and caregivers to provide interventions, while collecting testimonies for research into the care system. They ran workshops using various applied performance techniques to build the children’s confidence and record the testimony of those who had first hand experience in the care system to gain a better understanding of what is and isn’t working within the system. 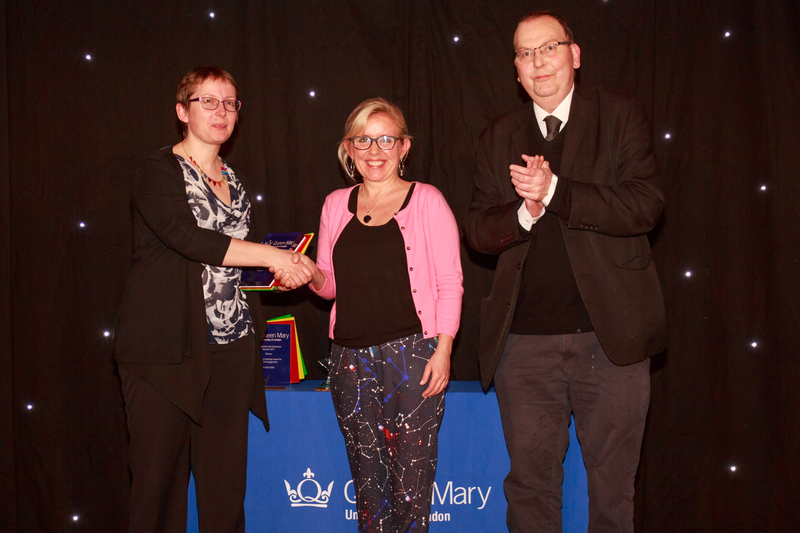 The Hawking Award for Developed Understanding of Public Engagment: Named after Lucy Hawking, novelist and daughter of Stephen Hawking, this award reflects Lucy’s qualities of reflexive, cooperative working, and her understanding of how to bring together research and engagement; this award is given to an individual to acknowledge their own critical thinking in the field of public engagement. People’s Palace Projects has spent the last twenty years creating and debating art that makes a difference to people’s lives. From London to Brazil, Liverpool to Azerbaijan, their creative projects and cultural exchange programmes have sought out contexts where art matters most and worked with those for whom art makes a true difference. The Centre has consistently paved the way in exploring the ways in which the arts can respond to urgent social crises and through both cutting edge research and long term international collaborations their work has, and continues to have, a tremendous impact on local communities in London and across the world. The Garriott Award for Leadership in Public Engagement: Named after Richard Garriott, entrepreneur and astronaut, this award reflects Richard’s qualities of innovation and leadership. 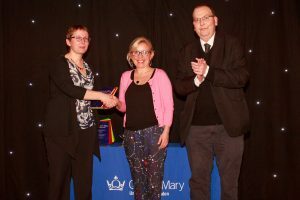 This award is given to an individual to reflect the extensive work they have done pushing forward the public engagement agenda, and developing others around them. As Director of Music, Paul Edlin has integrated public engagement within an innovative music programme incorporating the translation and representation of research through a diverse range of public activities and events. 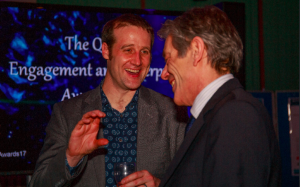 Through Paul’s boundless energy and enthusiastic leadership, Music @ QMUL has succeeded in fostering collaborations across faculties, and extending beyond our walls to develop long lasting, meaningful partnerships with external organisations from the London Chamber Orchestra to the East London St Paul’s Way Trust School. Best Opinion/Comment Piece: given to an academic who has written a persuasive and engaging piece which helps to shape public opinion or presents a unique analysis of their research. From the School of Languages, Linguistics and Film, Dr Will McMorran wrote an opinion piece which was published in The Independent about the challenges he faced when translating the Marquis de Sade’s infamous novel The 120 Days of Sodom. Written in 1785 in French, it is filled with violence and obscenity, which was the root of McMorran’s difficulties when working with Durham University’s Dr Thomas Wynn on the English translation. Best Published Research Campaign: given to an academic who has worked with the PR team to develop a successful media campaign for a research paper published in a peer-reviewed journal. From the School of Physics and Astronomy, Dr Guillem Anglada-Escudé, along with his team, found evidence of a planet orbiting Proxima Centauri, the closest star to our Solar System. The planet, called Proxima b, has a temperature suitable for liquid water to exist on its surface and may be the closest possible home for life outside our Solar System. 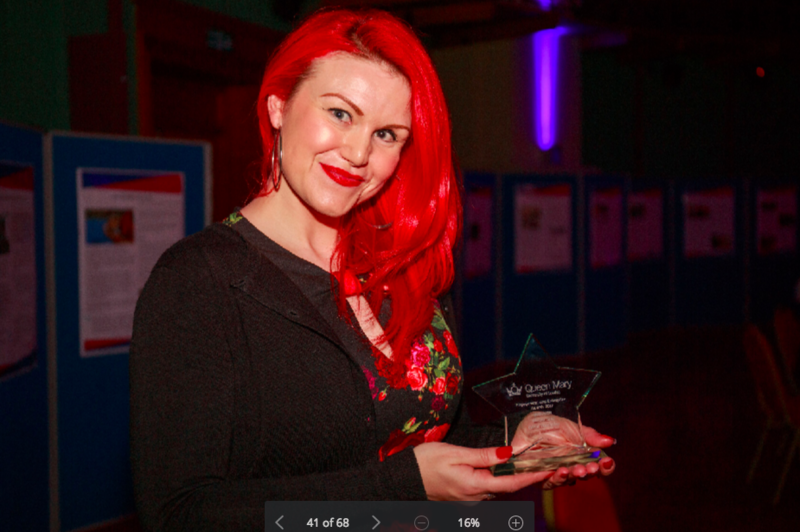 QMUL Media star: given to an academic who has sustained a high profile media presence in recent years through their research as part of the university. The technical curator at Barts Pathology Museum, which houses over 5,000 medical specimens, her research focuses on the general public’s attitudes to and relationship with human remains. She has written for The Guardian, carried out an autopsy of an obese specimen on BBC One, has been interviewed by Buzzfeed and VICE, and appeared on ITV’s ‘The Alan Titchmarsh Show’. Professor Lars Chittka’s research is concerned with the organisation of social behaviour, communication, perception, learning, and neurobiology of bees; the ways in which bees pollinate wildflowers and crops; and pollinator conservation. This year he was involved in four major research papers which earned global media coverage from the New York Times, The Washington Post, IFL Science, The Guardian and many more. Academic Commercial Enterprise: for the QMUL spin-out company or commercial agreement with an industry partner that has generated the most revenues and/or reached a significant commercial milestone, leading to an increase in the value of the opportunity. This company span-off from Queen Mary in 2007 and was based on Professor Sean Gong’s research into visual computation. Vision Semantics Limited developed the computer vision technologies and world-leading commercial platform for an intelligent video analytics solutions for security and business intelligence domains. Academic Non-commercial Enterprise: for non-commercial Impact activity. Some examples of this are: formation of a social enterprise or not for profit company or entity; the development of new cultural/creative innovative projects, activities or platforms that were developed in partnership with external companies or organisations to generate impact; and the licensing of open source software. Founded by AHRC, this was London’s Knowledge Exchange Hub where researchers, creative entrepreneurs, and businesses came together to explore the issues impacting on the capital’s creative economy. The £4.8 million project has, over four years, funded collaborative research, innovative knowledge exchange and provided substantial knowledge for SME’s policy makers and researchers. Proof of Concept Project: for the proof of concept that has achieved one or a number of milestones that could lead to a significant commercial or non-commercial enterprise in the future. This is a pill-shaped mini-camera called a ‘capsule endoscope’ (CE) that a patient swallows to allow the inside of their intestines to be examined by doctors. It has revolutionized the landscape of gastrointestinal investigation. Since 2012, the QMUL team in a joint collaboration co-led by Dr Shaheed, a robotics scientist from SEMS and Dr Mo Thana, a bowel cancer surgeon from SMD, the Blizard institute has developed the first prototype of a novel locomotion system for a CE. The prototype system can be steered and controlled from the outside, and can achieve speeds faster than the current CE technology. The Bruce Dickinson Award for Academic Entrepreneur of the Year: Named after Bruce Dickenson, lead singer of Iron Maiden, multi-talented businessman and Alumnus of Queen Mary, this award reflects Bruce’s spirit that has pervaded all of his business ventures. This award is for the individual who has demonstrated the most entrepreneurial activity or activities. ‘Dragonfly’ is at the forefront of visual science, featuring an innovative biological computational model that replicates how the human eye and brain process visual information in the first few seconds of viewing content. Supported with initial funding from the EPSRC college-funded Impact Acceleration Account, Dr Sovel undertook a secondment at Black Swan to help develop the product. ‘Dragonfly’ soon took off within the company attracting lots of client interest. Entrepreneurial Student of the Year: The winner of this award will be an innovative self-starter who can evidence that they’ve used their creativity and leadership skills to make a significant contribution to an entrepreneurial project (or multiple projects) over the past 12 months. Whilst studying mathematics Obehi discovered her passion for entrepreneurial pursuits and founded a tutoring business called ‘The Tutor Company’ through ideas surrounding ‘Math Theatre’ – an educational theatre company that inspires school children to study maths by using drama to demonstrate its practical applications in the real world. Obehi received a ‘Grow It’ grant from qEnterprise to develop Math Theatre. Most Promising Student Business of the Year: The winner of this award will be the business that can demonstrate they’ve achieved the most over the past year and has the best foundations for future success. This is a technology start-up founded to develop the world’s most cost-effective rehabilitation solutions to help stroke sufferers maximize their recovery, an idea which began when one of the founder’s grandparents had a stroke and struggled financially to get the rehabilitation equipment she needed. It was founded by medical engineering student Ross Ward in 2016 and he later received a £10,000 ‘Build It’ grant from qEnterprise in his final year of study to help him develop and build a prototype ready for trial and to show to investors. The company has now been recognized for outstanding innovation and potential to make a global impact. It was nominated for Innovator and Product of the Year 2016 and was a finalist in the MassChallenge UK Accelerator. 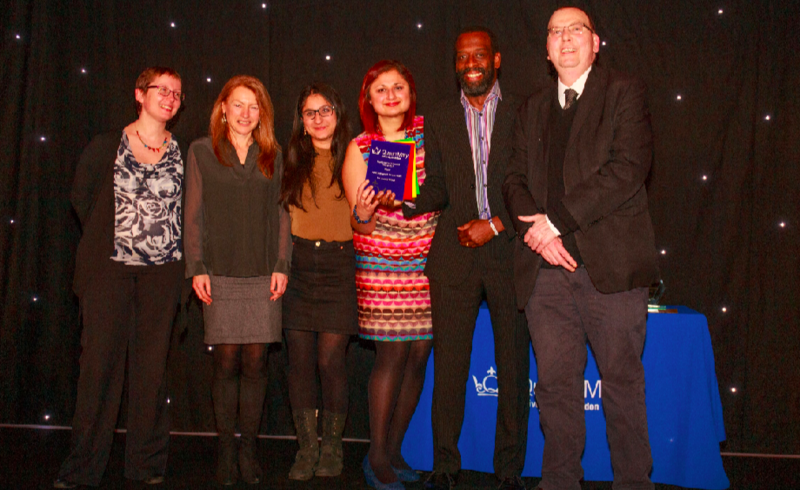 If you want to find out more about these projects, or those that didn’t win within the various categories, get in contact with the Queen Mary Centre for Public Engagement and ask for more information: publicengagement@qmul.ac.uk.